You are cordially invited to a party—to die for! 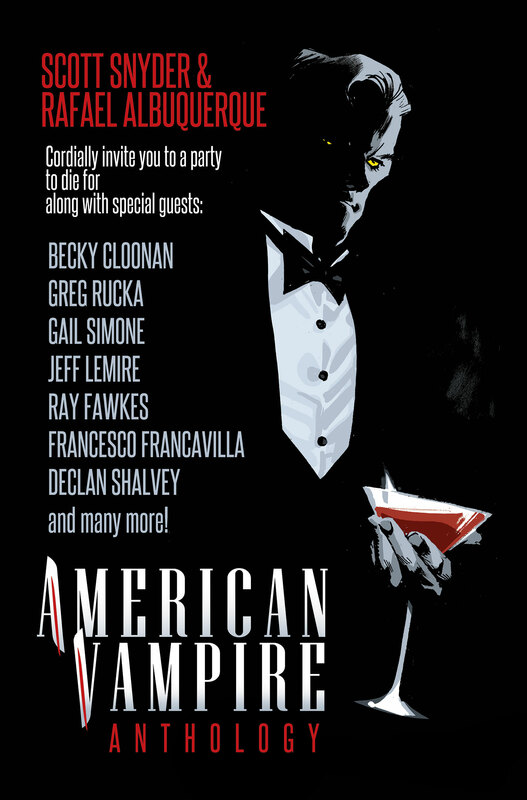 American Vampire Anthology features eight amazing stories set in the world of American Vampire, with “lost tales,” new characters and old favorites. The list of creators is impressive and long. But, with so much talent, could this be pulled off? And could it be pulled with a high quality narrative that ties into the mythos that Scott Snyder and Rafael Albuquerque have built? The answer is a resounding yes. Each individual involved in this release is immensely talented on their own and together they not only entertain, but are able to flesh out the world that’s been set up for all these years, even filling in some gaps for characters. And that’s what’s amazing about this issue. It can entertain with short stories set in the world of American Vampire, but also adds so much for those of us who have been reading since the beginning. It also shows that should Snyder or Albuquerque decide to pass on the series, that they have a long list of contributors that can do it justice. There isn’t one entry here that falters at all. There’s not one misstep at all. The entries are all about even, with fantastic stories and amazing art. It’s beyond a complete package showing off the strength of the anthology and the issue makes the case for its inclusion as best “one-shot” or “anthology” when the end of year awards come around. I could go on and on gushing about the comic, because it’s that dame good. This is a release that’s a solid for new readers as it is for long time fans and even though the issue boasts a hefty price tag, that’s worth the talent and quality with in. The only negative I can say about this is, it reminds me how much I’ve missed my monthly American Vampire fix. Though if I can get more quality releases like this while I wait, I might be filled with bloody goodness.